(2018) The air conditioning in the Media Library made the necessity of walking back into the heat to my car a chore at best. I love libraries. I love reading. I could make a case to stay here for the rest of the heat wave. 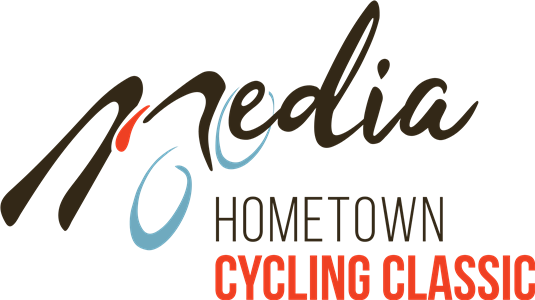 They sold Media Hometown Cycling Classic tshirts. I bought one. They also sold Capri-Suns on the porch and Philly pretzels. The criterium course’s first turn went around the building. They would come by every two minutes. Why go back outside? It is considered writing faux pas to start off a writing piece with copious references to weather. I’ll escape this duty by saying I’m no Tolstoy. I doubt anyone at Bicyclingmagazine will be calling me soon; they haven’t so far. But today was a scorcher. It made me relieved I waited out a decision. As I write from the comfort of my home, I would be gearing up for an even more difficult race, the Cat 1/2/3 race, which started at four in the afternoon. I melted earlier in the day. The view from the Media library's flagpole for the Masters 45+ race. The Media Hometown Classic has a clear goal on returning bike racing to the Philadelphia area. Their website features older photos of local cycling events. It’s a great idea to entertain the residents who have decided to stay home for the weekend instead of heading down to shore points in New Jersey and Delaware. There was a remarkable attention to detail for the event with a fan zone, kids races, and a healthy amount of volunteers. For a first year event, it felt like it had been around years. After the women had ripped around the course, I had a chance to preview what we were about to race. The layout was a paradox. As Gary Thornton, event emcee, questioned, “How does the course go uphill on both straightaways?” The descents could be found in the short chutes between turns one and two as well as three and four. With downhill turns come hay bale walls. There were several. According to Strava, this is near the four-percent portion of the hill on the back straightaway. To navigate the course one rolled slightly downhill on the bright roadway into turn one – around the library. A descent followed into turn two and a demoralizing view came into focus. The entire backstretch was a power climb. The left turn that ended the climb was waiting for you at the top, in view, for the ramp’s entirety. A slow left turn at the summit of the straight became a ripping descent into a left-hander (more hay bales) that doglegged into the finish straight, slightly uphill. Having done a scant two laps I wondered had warmed up too hard? What the hell was up with that backstretch? The temperature at the start had a real feel of 100 degrees according to weather people. In a rare experience I didn’t mind the heat. I had two water bottles for the race and planned to go through them. I was going to be there at the end, I told myself. The race started and immediately everyone had other ideas. FEC and Fifth Floor both had big groups of guys racing. I expected them to control the entire race. My plan, per usual, was to sit in the back and let the bigger guys block for me. This is risky but it kept me shielded from the strange winds circulating the course. With tall trees, low branches, and buildings close to the road it would normal to think the course was protected from winds. Each turn continued the mystery as to how we moved into a headwind. Meanwhile each lap got faster. The downhill short chute between turns three and four. I followed larger guys as the backstretch began to have a funny rhythm. The field would string out exiting turn two; but almost as if the leaders remembered we had an entire race remaining, they would sit up. The group fanned across the course and a pedestrian pace to the top of the climb ensued. Usually Fifth Floor, who had a rider off the front, controlled the climb. No one seemed eager to chase anyone down, so we would get a breather each lap about halfway up the climb. What is remarkable about the course is its numerous areas to catch onto the group. Riders yo-yoed off the back only to reappear moments later. This was the gamble riding in the back. Shortly thereafter I paid the price for my decision. I was racing nearly on the limit to stay in the draft of one of the bigger riders. As if on cue, five riders around me all sat up and decided the race was over. I was with these guys and concluded a sprint up to close the gap would only prolong the suffering. I was bummed/ relieved when I, too, had to pull the plug on proximity. Last lap leans through the final turn and into the sprint to the finish. Normally I would be downtrodden for having DNFd again. I was not. The race started with about fifty guys only to be whittled down to around twenty. This was truly a race of attrition. After stowing the bike and gear, I walked back to get an event tshirt. That’s how I found myself inside the Media Library. The librarian stated a beer from the fan zone would cool me off, but I declined on account of the long drive home and the legitimacy of my dehydration. I would have spent the rest of the day there if I had taken her advice. Perhaps that is how to do it next year: The course is set up for teams to celebrate bike racing. The straightaway would be a little more encouraging to keep the last wheel with rows of team tents. Much like the Tour of Somerville, I caught wafts of grills each lap from the tents that were in the fan zone. Had I been on top of things I would have convinced myself a second race would make sense. Luckily my sense of hesitation saved me. The second race would have been tougher. Hopefully this race will be back next year. On the way back to my car I noticed dozens of residents sitting in the shade of their front porch. Some were completely focused on the race. Others were reading a newspaper, peeking over the top of it every two minutes to watch the riders go by. Others merely carried on with their day but stole glances every couple of laps, taken in the spectacle. What else would you do when it is 100 degrees out? These are the moments we advocate for when a bike race event is pitched. And it looked so seamless in Media that it should happen again.